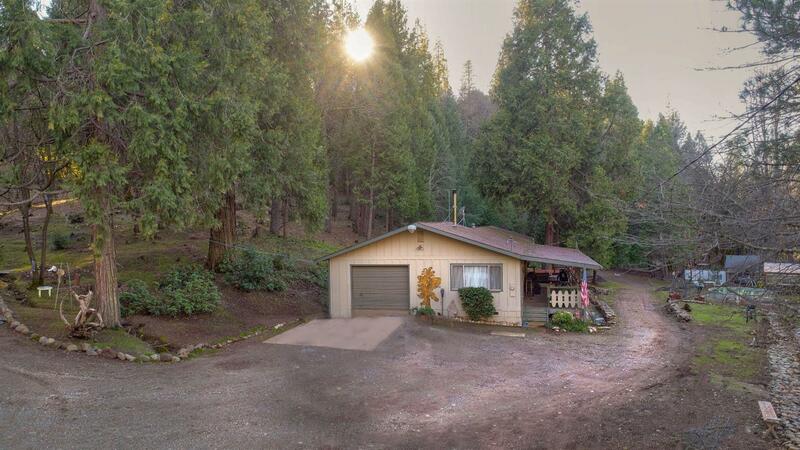 Almost 5 park-like acres with 3 bedroom 2 bath single level spacious home; large office could be 4th bedroom. On the grounds there is a partially enclosed pole barn, 2 room shop, partially completed granny flat, garden shed, 2 story pump house with finished upstairs room as well as 3 small storage buildings. Very usable acreage featuring a seasonal creek & pond overlooked by the large front porch w/hot tub. Fenced dog run in rear of home. Above ground pool & greenhouse in fenced garden area. Orchard with apples, plums, & cherries. Rustic foot bridge, fire pit, and many other places to sit and enjoy the property & wildlife. Mature trees, well maintained yard with fire prevention spacing. Great place to raise a family or retire! Unique landscaping. Don't miss this one!